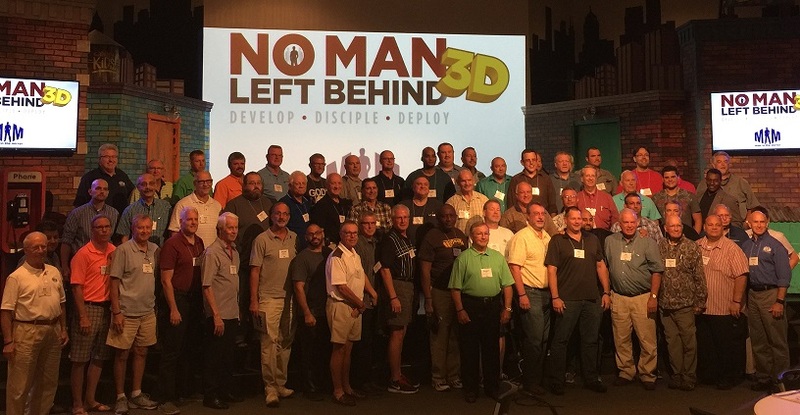 There was excitement in the air as 81 men from 26 different churches came together for the first No Man Left Behind 3D: Develop, Disciple, and Deploy training event this past weekend at Calvary Assembly Church in Orlando, Florida. The event was co-sponsored by MIM Area Director Pat Leupold, of the East Orlando Coalition for Men’s Discipleship, and Better Man Ministry. The men received training from Man in the Mirror Faculty Brett Clemmer, David Delk, and Jeff Kisiah during the weekend, ranging from understanding the No Man Left Behind Model to developing a plan for discipling men over the course of the next year. Neil Graubner (Men’s Leader from Calvary, the host Church) kicked off the training by praying for the men in attendance and the speakers. Calvary’s Executive Pastor, Mike Justice, also stopped to offer his support for the event in between his many other responsibilities. The Calvary Host Team did a tremendous job helping everyone feel welcomed and well-fed. The leaders of the 26 churches represented over 9,000 men in their congregations back home. There were also 4 Area Directors from Florida in attendance, as well as 1 Area Director from Arkansas and 1 Field Representative from Arkansas. Had a great time with all these guys, Kudos to Pat Leupold for organizing this event and getting the word out to churches! It was a great weekend for men’s discipleship and for the men and churches of Orlando!